The Air-cooled Screw Chillers, Chillers, Chiller Plants, Brine Chillers, Screw Chillers, Scroll Chillers, Air Chillers are suitable for working in extreme tropical weather conditions while maintaining energy and operational efficiency. 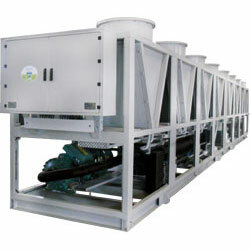 The equipment is designed and manufactured in compliance with superior designing and manufacturing standards. The environment friendly chillers are easy to install and are tested on all the required international parameters to be at par with the best.